As you know, many have come to believe that 2012 may be the year that human history comes to an end. Well, we at the Cleveland Movie Blog do not want to be caught unprepared by this impending apocalypse. So just in case the worst-case scenario does play out, I want to go to print with my list of Top Ten Best Movies of the year right now. I realize that 2012 is still quite young, but there may be no opportunity later. Charles Cassady's Early Top Ten Motion Picture Features of 2012 - Countdown in Reverse Order. I must thank the Mayans; easiest top-ten I think I've ever compiled. And even if the unthinkable happens and we're all here alive and well in 12 months, I dare to predict that RESURRECT DEAD will still sit at the summit of my list. It is grab-someone-by-the-lapels-and-drag-into-the-theater good, filmmaker Jon Foy's spooky, clue-by-clue unraveling of a real-life urban-phenomenon enigma. And it's also technically a 2010 documentary, having screened at Sundance and other specialty venues last year. Cleveland's premiere at the Museum of Art this week means we're near last in line to get something good, as usual. Still, I appreciate being able to End the World on such a mesmerizing cinematic note. Our protagonist in the nonfiction narrative is Justin Duerr, a Philadelphia street courier - with something of a curious history behind him, we later learn - who, in the 1990s, began to notice unusual objects embedded in the city's pavement. They are multicolored, homemade plaques, initially soft tile that has hardened permanently into the asphalt, reading in hand-carved letters "TOYNBEE IDEA IN MOVIE 2001 RESURRECT DEAD ON PLANET JUPITER." Duerr starts making notes of the tiles and at what intersections they can be found. He also begins taking photos of them. And he notes odd little sidebar messages, smaller than the main text, that complain of persecution, the Soviet Union, Knight-Ridder newspapers and something called the Cult of the Hellion. When the World Wide Web comes into common usage, Justin is astonished that a search of the "Toynbee message" online yields reports of identical mystery tiles in roads of other cities, throughout the North Atlantic states and even in a few South American thoroughfares. 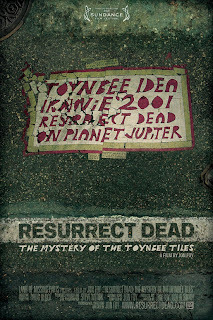 All seem to have been placed by the same unknown artisan - someone never caught in the act, even with one tile at the entrance of NYC's busy Holland Tunnel - and conspiracy theorists (including at least two rival documentary crews) are trying to decrypt the Toynbee Tiles and discover their author. Justin teams up with a few other like-minded individuals to evaluate tantalyzing evidence, which grows to include a famous historian/philosopher, a Philadelphia address, the map of the Conrail Train network, pirate shortwave-radio transmissions, a flippant 1983 newspaper column by a Knight-Ridder reporter - and an obscure 1984 one-act play by David Mamet that seems to paraphrase the tile's message of raising the dead on Jupiter. 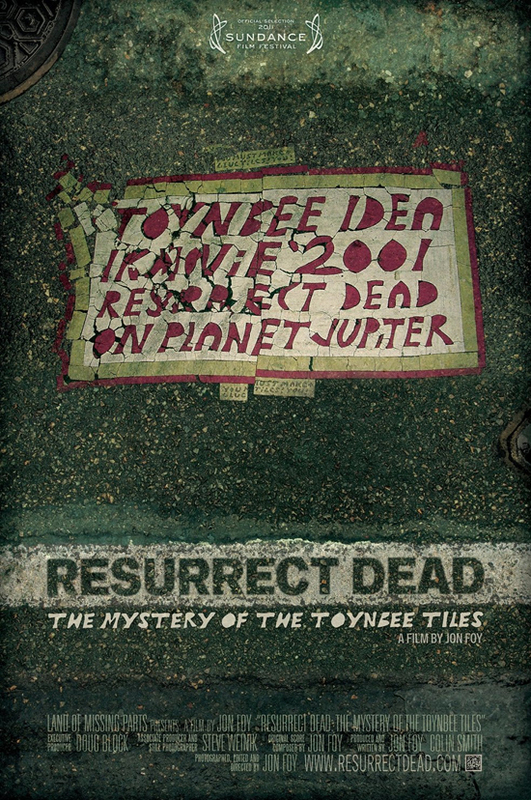 But Mamet claims he made up the whole concept himself and denies having anything to do with Toynbee Tiles. RESURRECT DEAD tells a fascinating whodunit/whydunit saga, much more so, I'd say, than last year's celebrated CATFISH, as the DIY investigators take us down the maze of blind alleys and possibilities and narrow down their list of suspects to three would-be tilers. Justin Duerr makes the perfect guide for this Mission Bizarro, an apparent obsessive tracking down another obsessive. There are times, when filmmaker Foy (who also wrote a terrific and haunting musical score) feeds us tidbits about Justin - he's been a pigeon fancier, fallen art student, teen runaway, squatter, walking billboard of tattoos, and champion of self-trained and "outsider" artists - that lead us to wonder whether HE could be the Mad Tiler, perhaps with some kind of multiple-personality disorder (or a penchant for public performance-pranks) placing the tiles in one identity, then hunting the invisible perp in another. It's not too much of a spoiler to say that's not the case - though it's fairly evident early on that mental illness, likely paranoid schizophrenia, afflicts the tile's originator, while nobody flatly states that. The docu ends with a satisfactory solution, yet just enough mystery preserved to ensure that we haven't heard the last of the Toynbee Tiles. And indeed, I've just discovered that the band the Vivians have a sort-of song about them (more a cacophony), which is fitting in so many ways, if you know that the Vivians take their name from a sprawling private art/fiction project created by reclusive Chicago janitor Henry Darger completely apart from the outside world. i don't think i've encountered tt on any wanders but have encountered the space invader tiles in paris, new york and barcelona - are you up on this similar bit of street art? just watched it. excellent film.